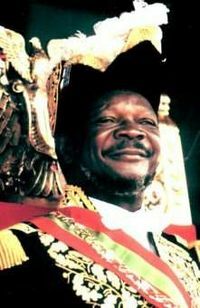 Jean-Bédel Bokassa, the President of the Central African Republic, had himself crowned as Emperor Bokassa I. In 1971, Bokassa promoted himself to full general, and in March 1972 declared himself president for life. He survived another coup attempt in December 1974. The following month, on 2 January, he relinquished the position of prime minister to Elizabeth Domitien. His domestic and foreign policies became increasingly unpredictable, leading to another assassination attempt at Bangui M’Poko International Airport in February 1976. A coup d’état in the Central African Empire overthrows Emperor Bokasa I, born Jean-Bédel Bokassa 22 February 1921 – 3 November 1996), also known as Bokassa I of Central Africa and Salah Eddine Ahmed Bokassa, was the military ruler of the Central African Republic from 1 January 1966 and the Emperor of the Central African Empire from December 4, 1976, until he was overthrown on 20 September 1979. Bokassa’s overthrow by the French government was called “France’s last colonial expedition” (“la dernière expédition coloniale française”) by veteran French diplomat Jacques Foccart. Operation Barracuda began the night of 20 September and ended early the next morning. An undercover commando squad from the French intelligence agency SDECE (now DGSE), joined by Special Forces’ 1st Marine Infantry Parachute Regiment, or 1er RPIMa, led by Colonel Brancion-Rouge, landed by Transall and managed to secure the Bangui Mpoko airport. Upon arrival of two more transport aircraft, a message was sent to Colonel Degenne to come in with his Barracudas (codename for eight Puma helicopters and Transall aircraft), which took off from N’Djamena military airport in neighbouring Chad. How is a landlocked and post-conflict country supposed to deal with the high cost of living and mounting fuel prices? This is the painful question being asked by many economic operators, development partners and policy-makers in the Central African Republic (CAR), where implementation of World Bank projects is being seriously compromised by the current situation. The face of Bangui, capital of the Central African Republic, bears witness to the difficult situation experienced by the country. The landlocked city is saddled with the triple handicap of high prices for basic commodities, attendant runaway inflation, and armed conflict. Unfinished construction projects, poorly maintained roads, ageing automobiles and wrecked houses all underscore the harsh fact that some countries are more gravely affected than others by rising oil prices.